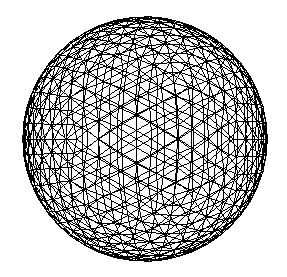 In my last post, I showed how to generate an icosphere, a subdivided icosahedron, without any fancy data-structures like the half-edge data-structure. Someone in the reddit discussion on my post mentioned that a spherified cube is also nice, especially since it naturally lends itself to a relatively nice UV-map. The exact same algorithm from my last post can easily be adapted to generate a spherified cube, just by starting on different data. If you look closely, you will see that the triangles in this mesh are a bit uneven. The vertical lines in the yellow-side seem to curve around a bit. 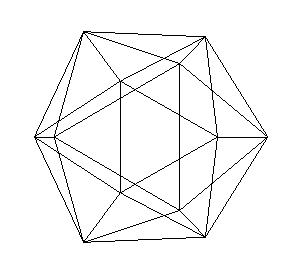 This is because unlike in the icosahedron, the triangles in the initial box mesh are far from equilateral. The four-way split does not work very well with this. Instead of splitting all three edges, we’ll only split one. The adaptive part here is that the edge we’ll split is always the longest that appears in the triangle, therefore avoiding very long edges. Here’s the code for that. The only tricky part is the modulo-counting to get the indices right. The vertex_for_edge function does the same thing as last time: providing a vertex for subdivision while keeping the mesh connected in its index structure. Note that this algorithm only doubles the triangle count per iteration, so you might want to execute it twice as often as the four-way split. Instead of using this generic of triangle-based subdivision, it is also possible to generate the six sides as subdivided patches, as suggested in this article. This approach works naturally if you want to have seams between your six sides. However, that approach is more specialized towards this special geometry and will require extra “stitching” if you don’t want seams. 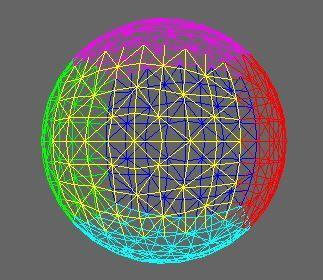 The code for both the icosphere and the spherified cube is now on github: github.com/softwareschneiderei/meshing-samples. 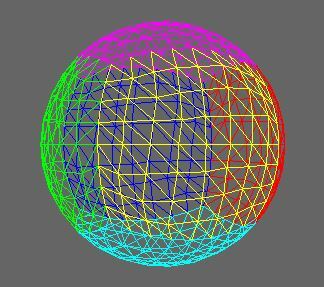 If you want to render a sphere in 3D, for example in OpenGL or DirectX, it is often a good idea to use a subdivided icosahedron. That often works better than the “UVSphere”, which means simply tesselating a sphere by longitude and latitude. The triangles in an icosphere are a lot more evenly distributed over the final sphere. Unfortunately, the easiest way, it seems, is to generate such a sphere is to do that in a 3D editing program. But to load that into your application requires a 3D file format parser. That’s a lot of overhead if you really need just the sphere, so doing it programmatically is preferable. At this point, many people will just settle for the UVSphere since it is easy to generate programmatically. Especially since generating the sphere as an indexed mesh without vertex-duplicates further complicates the problem. But it is actually not much harder to generate the icosphere! Here I’ll show some C++ code that does just that. There you go, a customly subdivided icosphere! Of course, this implementation is not the most runtime-efficient way to get the icosphere. But it is decent and very simple. Its performance depends mainly on the type of lookup used. I used a map instead of an unordered_map here for brevity, only because there’s no premade hash function for a std::pair of indices. In pratice, you would almost always use a hash-map or some kind of spatial structure, such as a grid, which makes this method a lot tougher to compete with. And certainly feasible for most applications! The lookup-or-create pattern used in this code is very useful when creating indexed-meshes programmatically. I’m certainly not the only one who discovered it, but I think it needs to be more widely known. For example, I’ve used it when extracting voxel-membranes and isosurfaces from volumes. It works very well whenever you are creating your vertices from some well-defined parameters. Usually, it’s some tuple that describes the edge you are creating the vertex on. This is the case with marching cubes or marching tetrahedrons. 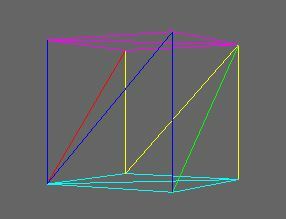 It can, however, also be grid coordinates if you sparsely generate vertices on a grid, for example when meshing heightmaps.